Keen to try Something New This Year? engage, inspire and activate your workforce? Just delivered a top project? We focus on bringing people and businesses to the next level by creating, delivering, and improving complete wellbeing programs. Our unique 7 steps approach begins with an analysis of your current situation and takes you through developing wellbeing leaders internally, enhancing your current climate, managing change, marketing wellbeing activities to ensure maximum impact & value to create evidence based programs that will continue to transform over time. We believe that happy and healthy people will make any business thrive. 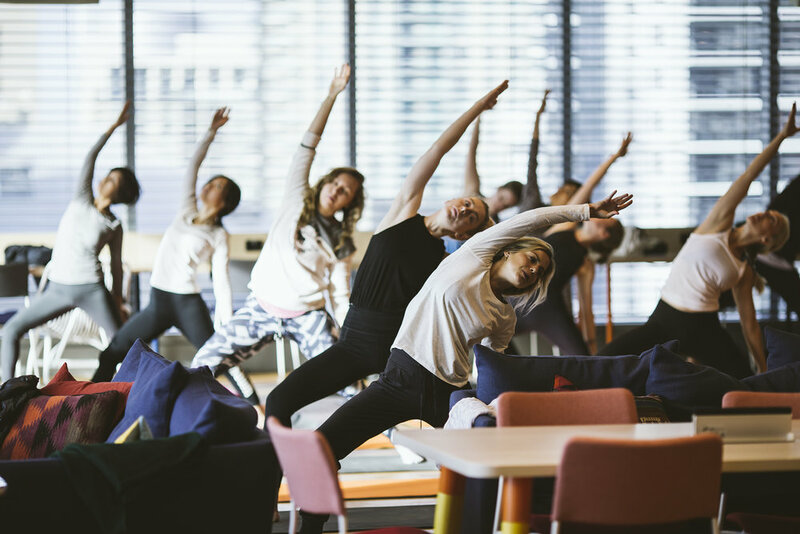 So we focus on improving the wellbeing and productivity of individuals with our corporate wellbeing programs. We focus on wellbeing because once you master this part of your life, the rest is easy. We also focus on wellbeing because most people don't, and are therefore unfit to live life to the fullest. We understand that wellbeing is a broad term, with a meaning differing from one individual to another. We therefore target our offering to a limited amount of people, aiming to get to know, and personalise our offering to the individual's needs.We take the greatest of pleasures in what we do, and therefore, we do it well. Joannie is an amazing and positive individual. Her coaching is truly transformative and delivers results. I would recommend Joannie to any busy working person who is looking to bring balance to their week. Joannie is organized and professional and caters for individuals that have competing demands. Joannie showed me how food can feed my mind, not just my body. Thanks to simple and steady changes in my habits, I’ve increased my energy, my focus, and my productivity in the workplace and in sports. Get ready to receive amazing content. Mindfulness has become a very voguish word over the last few years, but how exactly does it work and how can you actually practice it? In this workshop, you will learn the fundamentals of the art of practicing mindfulness. This environmental awareness training workshop highlights how employees activities, the materials or products they use and create, can have large impacts on the environment. The course is designed to promote more sustainable environmental practices within the workplace and in the attendee’s personal lives. The office is perhaps one of the most complex environments for emotions. Combine different personality types, competing priorities, different organizational goals and a high stress level in the same workspace and the idea begins to form about how important it is for leaders to understand how to harness emotions to cultivate productivity and positive relationships. This workshop is designed as a blend between a fun way to celebrate, and a creative way to explore the benefits of mindfulness meditation. An expert sommelier will guide participants through a mindful sensorial experience. We will be bringing a curated range of local wines, exploring the depth, colour, and characteristics of each ones. To put things in perspective, 100 years vs. infinity is nothing. In the blink of an eye, we’ll be gone. You’ll be looking back and thinking “I should have been engaged, laughing, fully present, and now I’m dead”. Thankfully, we still have a great amount of time on our hands, and without doubt, the best use of the world’s most precious resource is done when we are fully present. We now know that happiness is the precursor to success, not merely the result. It makes sense to invest in our happiness before we invest our efforts elsewhere. Some actions seems to provide a greater return on their investment than others, so we thought it was a good opportunity to dive into a few of them today.